I read somewhere once that No. 22 came in as a close second to No. 5 when Madame Chanel was deciding on the first composition to release in 1921. Of course we all know she chose No.5 and No.22 was released the following year. These are definitely sister fragrances though and carry many of the same notes. However, No.22 isn’t quite as sweet as No.5. It’s a bit more reserved. A bit more powdery. I own No.5 in parfum and No.22 in EdT, so my comparisons are based off of these concentrations. 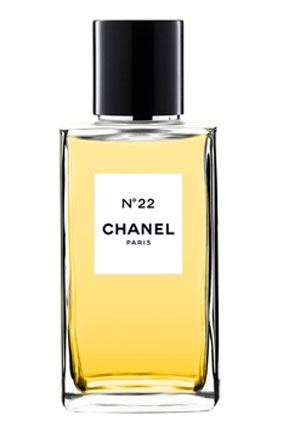 No.22 starts out heavy in the aldehydes and dries to a mainly jasmine, ylang, and vetiver on my skin. I really don’t get any vanilla at all. It smells pretty clean with tiny bit of muskiness towards the base. But it never crosses into anything remotely skanky. I could see a bride wearing this on her wedding day but I can just as easily see me wearing it out casually, which I do, as it’s priced pretty fairly at around $1.50 US/ml. The younger generations may think No.22 smells ‘old lady’ but when I smell it I think of a chic, classy woman in a tailored skirtsuit. A Jackie Kennedy. It’s very prim and proper but still fun and not quite uptight. For me it was love at first sniff. I HAD to have it! In fact, I was so haunted by it for weeks after testing that I was compelled to have it. Not many fragrances I’ve come across have impressed upon me as much as this one did. The general concensus is that No.22 is a spring/summer frag but I think it works well all year long. In fact I’m writing this in January after wearing it all day today and it performed beautifully on such a cold, rainy winter day. It’s also pretty non-offensive and could be worn appropriately just about anywhere at anytime. Easily made a signature fragrance. This frag is a very simple, minimalist perfume, very closely related to “Not a Perfume” from the same house as they share the same main note of Ambroxan. But Anyway has a bit more layers with the added notes of lime, neroli, and jasmine, which add a sparkling “fizzy” quality to the fragrance. On initual spray it is very alcoholic, like most perfumes are, and almost smells like nothing else besides synthetic alcohol, but very quickly the jasmine and neroli begin to peek their heads in before complete dry down and gradually develops strength as they warm up. The notes are relatively synthetic smelling but not in an unpleasant way. Think laundry detergent and soapy freshness. It’s very pleasant actually and very non-offensive. The perfume continues to strengthen for the first 30 minutes or so, creating a decent sillage that lasts most of a day. This frag is deceptively strong. Although it isn’t a powerhouse of a perfume and the projection stays within arms length, it sticks around much longer than one would anticipate for such a simple fragrance. On skin it lasts most of the day. On clothes for several days. Many people have claimed in reviews to be anosmatic to the smell, and although it IS a relatively light perfume, I can assure you it IS there! Just as you would get used to the smell of your laundry detergent in your clothes where others can still smell the freshness, so is the same for Anyway. The bottle is very fitting as this is a ‘clean, pure white” fragrance. And it is very gender neutral, being the epitome of a unisex fragrance, not unlike a bar of soap or laundry detergent. Although recommended for the spring and summer months, and I agree it IS a warm weather fragrance with the neroli and lime notes, I see this as being a very appropriate year ’round office scent or gym scent, or anywhere you’d be in close proximity to others and would not want to overpower them with perfume.